There's no better way to improve water and nutrient infiltration than to break up the hardpan. To accomplish this, the 2500 Series features a heavy-duty 4” x 4” tubular welded frame, walking tandems and gauge wheels on every full wing frame. These components combine to keep the chisel points at depth no matter how rolling the terrain. Chose the shank to match the task: the 650-pound conventional flat shanks with extension springs will provide soil shatter in lighter soils. 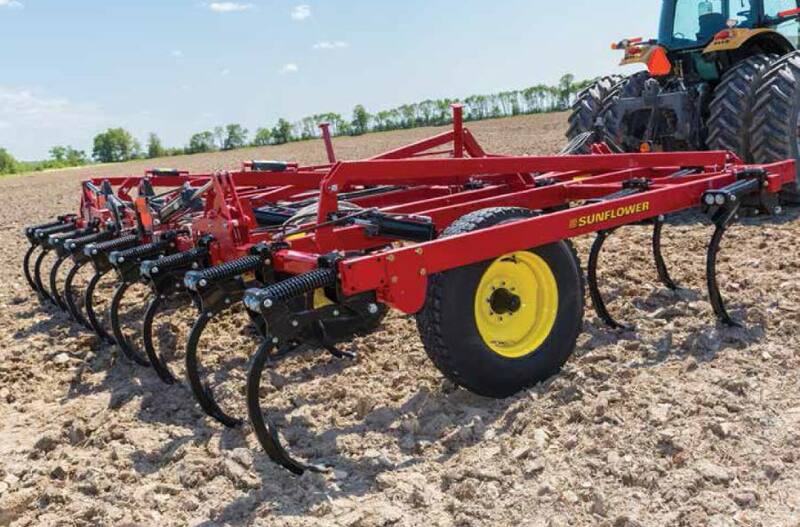 The heavier 1000-pound “On-Edge” shanks can work deeper into heavier soils. A level-lift hitch is standard equipment on all models an optional floating hitch with synchronized hydraulic gauge wheels for ground hugging performance in rolling terrain is available on sizes 31' and larger. To get the field finish to satisfy your program, chose from three finishing attachments available for the SF2500 Series chisel plows. 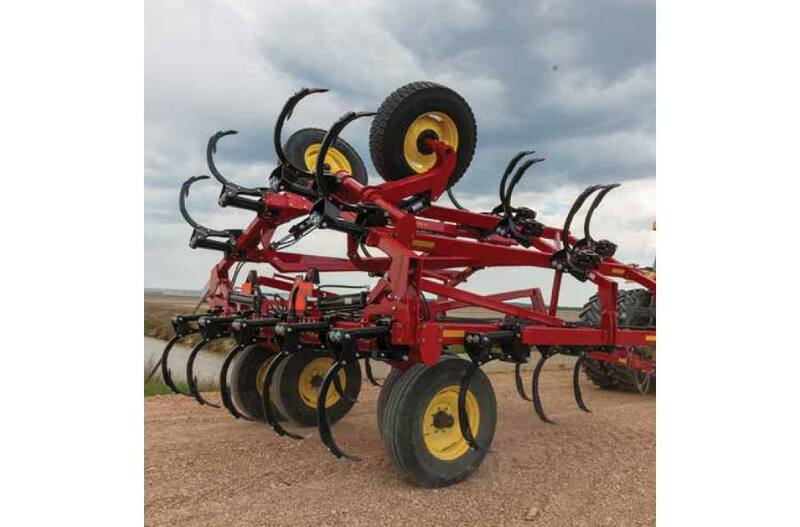 Frame: The frame is constructed of strong 4 x 4 inch steel tube and has the strength to meet the demands of tough tillage. The structural integrity of the tool will be maintained for the life of the tool. Tongue: The tongue is a welded A-Frame design is available in level lift for all sizes, or with the floating-hitch option for tool configurations thirty-one feet or larger. Standard equipment includes a category five hitch (2” pin hole), screw type jack, hydraulic hose loom with storage for the 7-pin electrical, and the operator’s manual. Shanks: The 2500 Series features two different shank assemblies in 12 or 15 inch shank spacing. The 650 pound point pressure shank is an extension spring with 32-inches of clearance. The 1000 pound point pressure load shank (shown) is a compression spring on-edge with 30-inches of clearance. Both shanks available have 9-inches of vertical travel to clear obstructions. Single Point Depth Control: The front mounted single point depth control sets the operating depth of the entire machine with a single simple adjustment. The shank is made of 1-1/4 x 2-inch hot formed, spring steel for high strength and long life. Wheels & Tires: Option: New or Used Tires: The 2500 Series chisel plow is equipped as standard equipment with walking tandem axles, 2-1/2-inch spindles, (4) 12R22.5 used truck tires or VF295/75R22.5 new tires, and 8 bolt hubs on all main frames and 9-foot and larger wing frames. The small wing frames are equipped with single 12R22.5 used truck tires or VF295/75R22.5 new tires and 8 bolt wheels. Gauge Wheel (Floating Hitch): The optional floating hitch pivots between the tractor and main frame allowing the unit to follow the contour of the ground. The front caster gauge wheels are mechanically synchronized to the main lift axle to maintain a level frame when the sweep depth is adjusted. The 2530 Series with a floating hitch features 31x13.5-12 ply tires with 6 bolt hubs on the stabilizer gauge wheels. Reel & Coil Tine Harrow: The 13 inch diameter finishing reel and 2 bar coil tine harrow shatters clods while mixing the soil with crop residues. The result is anchored residue and a level soil surface. The tine angle is adjustable and the spring down pressure can be varied on each component. Coil Tines: 5/8 x 26 inch; 2 bars; 12" spacing. The 13 inch conditioning reel has eight spiral blades made of 1/4” X 1-1/4” flat bar steel. The reels rotate on triple lip sealed flange bearings with lube fittings. 3 & 4 Bar Coil Tine Harrows: These heavy coil tines level the soil and evenly distributes crop residue. The tine bars have adjustable down pressure with tine angle adjustments to match field conditions. The coil Tines are 5/8 x 26-inch and spaced at 12-inches on a common bar producing an effective tine spacing of 4-inches on 3-rows or 3-inches on the 4-row attachment.